Blogphilosophy: does #peace, pacifist education exist in #MOOC? How many MOOCs focus on building peace? It seems not too many, yet we all need it. So… this blog rolled out of my keyboard. It used to be that July and August were said to be leisure months. In Flemish: cucumber time: a time where nothing important is said or done, and life can be lived and enjoyed in simple ways. With social media, networks and connected communities… this is no longer the case. No matter how hard I try I cannot keep war and conflict out of my mind’s eye. It is there, and it provides me with tons of anxiety for I myself feel helpless while watching the world stage as it is alight with anger and grief across multiple regions. Here I stand. And in all honesty, there is not a single course of action I seem to be able to take. The powers that be are using all their influences - no matter from which point of view - to instill all of us with the thought that “war is necessary and good”. Propaganda has multiple tongues, the media is everywhere, and humanity has nowhere to hide. War never pays off for us normal folk. It never does, simply because it is always us citizens and civilians that pay the price. We are canon meat. Now more than ever, as guided missiles, drones, and long distance weapons in general are deployed by whomever, whenever. And as such, many citizens turn to social media (if it is not censored by government) to share their plight, giving a human face to evil circumstances on both sides of any fence. As I was taken aback by my own powerlessness, a mail came in from FutureLearn (blog picture), telling me the upcoming courses. And what did it show me? Four courses related to warfare and telling me either what good came out of it, or how war changed the image of heroism. 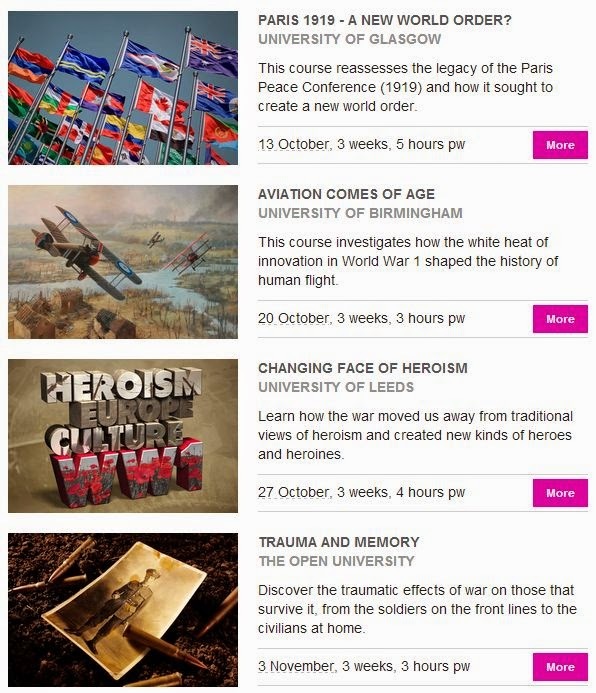 Luckily one course will focus on trauma from war, which seems more in touch with the horrors of war. Although these war courses are related to celebrating the end of World War I, I was dumbfounded. And then it struck me that peace is celebrated so little in current times, and particularly in open education. But how can we propose education for all if we do not provide free courses on obtaining peace, on celebrating togetherness? Is academia so distant from the concept of peace that it does not come to mind to provide teaching on creating peace, or harmony, or simply living together? Or is it too difficult to obtain? We all know it is possible, theoretically that is. So I started to search some of the MOOC providers, searching keywords like “peace”, “pacifism” and “nonviolence”. And that resulted in only one course, a Spanish course provided by Mirada and not yet with a fixed starting date (https://www.class-central.com/mooc/2229/mirada-x-paz-y-noviolencia ). Of course I am not a specialist in the field, and maybe these keywords are not used, but still… it made me wonder in which educational world I live in. So can someone please build a peace MOOC? I am more than willing to help in some way (no content expert, but I do feel I could support in some way). No funds needed, just doing it will make a difference. There is no greater good for all of us, except humanity in its frail and bare self. If we kill, we are beasts in state of hunger and ignorance. And as I learned in primary school, we are all part of the same ecosystem, and as such humans are vulnerable to nature just like all other living beings. Maybe nature will help us understand our precious human condition once again. Unfortunately, nature is already taking lives of innocent people who live peaceful lives. So maybe nature will march forward in its almighty variety? All it takes is one airborne Ebola infected person (I admit luckily it has not come to that, but time is always on the side of small living creatures and human and infrastructure resources are scarce in the affected regions). So let’s imagine one such a person is to fly to each of the conflict zones (each time at each side of the fence). But it might just happen without any planning, just nature taking its course, and humans dying equally. Would this result in more propaganda? Probably as any devastating human loss tends to result in propaganda, at least at first, for as long as we do not take up a shared responsibility of our earth and all of our neighbors, we are prone to divide ourselves into ‘good’ and ‘evil’ however stupid this dichotomy is in the face of all of us who try to live a simple life. But maybe after the pandemic, we will all understand our own vulnerability, and how precious life is to all of us and who knows rebuild a more grateful, open society. Finally the inspirational and informative report of Massive Open Online Courses for Development (MOOC4D) is published by the Penn University, and it can be downloaded here (link I got at first was not working, so added a new indirect link. Once I have retrieved the official link I will put that one in). The panel discussions are also available online here. The conference on MOOC4D was held in April 2014 and it focused on the challenges and potentials of MOOCs in developing countries. The conference existed of panel discussions on various MOOC topics. And thank you to John Traxler for sending me the link! The conference report offers a good deal of interesting reflections: the free model versus sustainability, using a blended learning model to combine what is best from online and face-to-face classroom teaching, ... and as the report mentions it is the start of the MOOC4D narrative as the new options are unfolding. Many questions that resounded during the panel discussions are mentioned in the report as well: "How MOOCs might or could fit in with Higher Education" (a global question and debate) and the ever reoccurring question: "how do we measure the impact of MOOCs". Where I feel the latter question is just a conundrum coming from an established order looking to calculate profit, where in fact profit resides in non-numeric and very qualitative profit. Education (in all its variety) works for everyone, whether you have self-taught learners, or kindergarden/primary/secondary/higherEd learners. Education is a primary human need, and should - in my view - not be pushed into boxes coming from production oriented analysis. And although I understand the need for benchmarks related to quality, getting education on the rails is the most important thing. Because let's face it, education in the Global North (and not related to MOOCs) still faces a lot of challenges. So any benchmarks based on a failed education in another part of the world, might not be the best structure to measure success. Produce education and rely on experienced teachers to provide content guidelines, they know. No matter where you live in the world, and experienced teacher makes a difference, knows her or his stuff and gets students inspired. The quest to provide research based evidence to upgrade or at least hold on to older employees, and build a rationale to keep them in corporations based on their expertise and knowledge. EU, US, Canadian statistics are clear, we have an aging population and there is a need to keep employees at work, in meaningful work based on their expertise and knowledge. It is a marginal option that I can chose to work on after my PhD is finalized (yes, still a lot to do, but ... reflection is a nice pastime). It feels like an interesting professional research and knowledge niche. So this subject is just something that sits in the back of my mind as I work on my heutagogy-MOOC-online learning based PhD topic, for I see a future in MOOCs or by that time enhanced, global online learning - for older, lifelong learners, including employees. While looking for a solid research definition of 'learning episode' I came across a FREE, online book from 1971 by Allen Tough entitled 'The Adult's Learning Projects: a fresh approach to theory and practice in adult learning'. The book is freely available online (per chapter) and chapter 2 provides a really handy definition of learning episodes, which comprises learning actions, and relates it to personal learning goals of the learner. I am still filtering out a transparent, useful definition that I can converge to my research participants, but getting there and will hopefully be able to share soon. So all of a sudden I find a short overview of what I look at, in a brief learning project dating from 1976, done by Roger Hiemstra (a very Fries/Dutch name at that - I am 25% Fries, so it feels familiar even though the researcher worked for Iowa State University), and where adult learning is connected to learning happening in older learners (older defined as 55-64, and older then 65 years). At present a nice paper that emerges from my pilot study findings, and relates to this over 40 year old research begins to crystallize in my head. And I like it. As the New Media Consortium report is out looking at the upcoming trends for k12 and online learning, I was pleasantly surprised by the emerging combinations which clearly embrace new educational technologies and student-centered focus. The almost 50 pages report is a source of interest for any teacher, school, or elearning expert. It provides a nice overview of new options and trends for young students, as well as interesting assumptions. 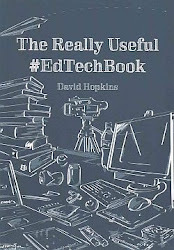 One of the assumptions is: mobile acceptance in schools, teacher proficiency in a variety of digital skills, and even the contemporary classroom (filled with ICT and edtech options). This is the ideal setting and for many schools not (yet) achievable. Nevertheless the points raised in the report are interesting. For those with little time a quick read through the 9 page preview report will already raise interest, but for those having more time, I do recommend reading the full report as it narrates not only what is to come, but also why the authors of the report think so, and what importance it can have. The NMC reports always have the same structure providing a nice overview of which technologies are already adopted, which to watch out for and what lies in the (5 years) future. 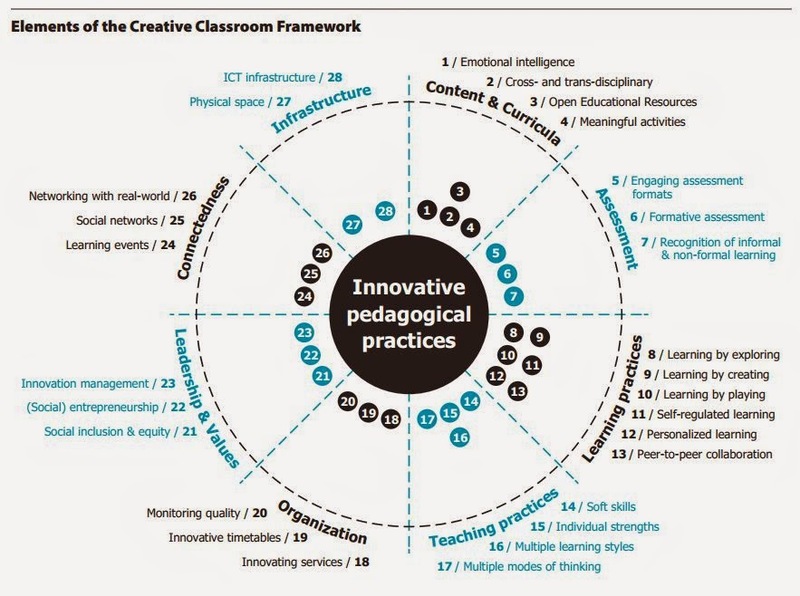 The emphasis on the importance of networked learning, open content (open educational resources or OER), cloud computing and the allround student (and teacher) mobility is nice to read.
! Creating Authentic Learning Opportunities.
! Integrating Personalized Learning ..
! Complex Thinking and Communication ..
! Increased Privacy Concerns . In the next couple of weeks I want to gather the next #eMOOC2015 group of MOOC colleagues (in the broad sense) that will help me and my fellow chair Nathalie Schiffino in assembling the committee for the eMOOC2015 experience track. Both Nathalie and me are the chairs for the experience track. How many people will be in the experience track committee? Between 8 and 10 people. I ask every one of you if you could send me suggestions: MOOC people that you admire, and that have set up or lead a successful MOOC or MOOCs. The experience track committee will consist of MOOC practitioners with shown experience/s in MOOCs and MOOC-related contexts. 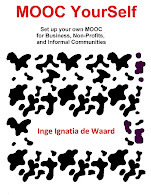 If you know of a really fabulous MOOC experts with a clear and strong MOOC background, mail them to me ingedewaard at gmail , add them in a comment to this post, or tweet them @ignatia. I will gather all of the names, and select a committee in collaboration with Nathalie. For those not familiar with the eMOOC stakeholder summit, look at the past eMOOC2014 summit which took place in Lausanne, Switzerland. This is a world MOOC summit, but organized in Europe. Most of the major MOOC stakeholders were present during those three days and the summit resulted in many collaborations and of course in a multitude of knowledge transfers. Where will eMOOC2015 be organized? eMOOC2015 will be organized in Mons, Belgium. Who can you suggest, or who is welcomed? Every experienced MOOC leader is welcomed. So anyone with an interesting (positive) experience in either the corporate, academic, or k12 world is a potential member of the eMOOC2015 experience track. I would like to include a mix of MOOC experiences even in the basis of the experience track committee (so mixing k12/corporate/academic experts - enabling a horizontal presence of those experiences during the summit and in the organization). What will those who are selected for the committee have to do? Suggest possible keynote speakers for the summit: the keynote speakers are selected by all the chairs, so only suggestions can be made by each track committee. What do experience track committee members get out of it? No money, just esteem and networking connections. Is this the regular way of gathering a committee? No, it is not. But I thought it would be a nice way of gathering new names. and of course, very important for a PhD: rationales for each step. For my research I look at experienced online learners (adults in most cases), and how they self-determine their learning (this links to heutagogy, I wrote briefly about the why of this approach in an earlier post here). There are multiple reasons why I like this: relevance to lifelong learning, adult learners can be more self-determined due to their own experience or professional/personal needs, it is advanced learn-to-learn combining personal goals with digital skills with a mediation linked to critical thinking (which content do I find of interest, of all the discussions I am engaged in - who do I learn from, which argument do I feel is more to my liking...). This emphasis on experienced (adult) online learners immediately opens up the MOOC space for me, it brings it back to its first roll-outs (cfr. CCK2008) and it relates to what young as well as adult learners do in terms of 'internet use for learning': you want to find a solution for something, you connect through the internet (tools, objects, people), you surf the net, you connect with others, you make curate in your mind what is useful, and assemble the information into new knowledge (well, that is how I think it goes, but a lot needs to be investigated). An adult learner makes decisions for their learning, they make their own decisions based on their own expertise (I assume here): we all have our own agenda's, and as such we need different bits of information (chosen drops from the Internet fountain or our own networks). Of course in this learning chaos, there might also be emergent learning happening, no matter how experienced one is as a learner, and this is of course also of interest (how does it work, might it become integrated in durable learning...). So my central research question is: "How do experienced online learners manage self-determined learning when engaged in a MOOC in order to attain their learning objectives?" In order to investigate this, I was looking for research participants that would be engaged in MOOCs that would attract or support that type of learning. And I wanted MOOCs that had different feels to it as well, or could attract different populations that would (possibly, hopefully). I was also looking for MOOCs that would take more than two weeks, as research shows that there is an interesting chasm in interaction between week 2 and 3 of a MOOC. 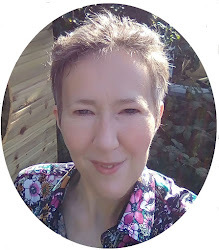 And as I am part of The Open University and its partners, I have the pleasure of being able to ask MOOC organizers from different universities that are all part of FutureLearn to see whether I have their permission to gather research participants from their MOOCs. The Science of Medicines: learn the science behind how and why medicines work, and what can improve the patient treatment experience. This MOOC is organized by Monash University in Australia, and lead by Ian Larson. The Monash University is a leading university for pharmacy and health courses, and I really look forward to the course. 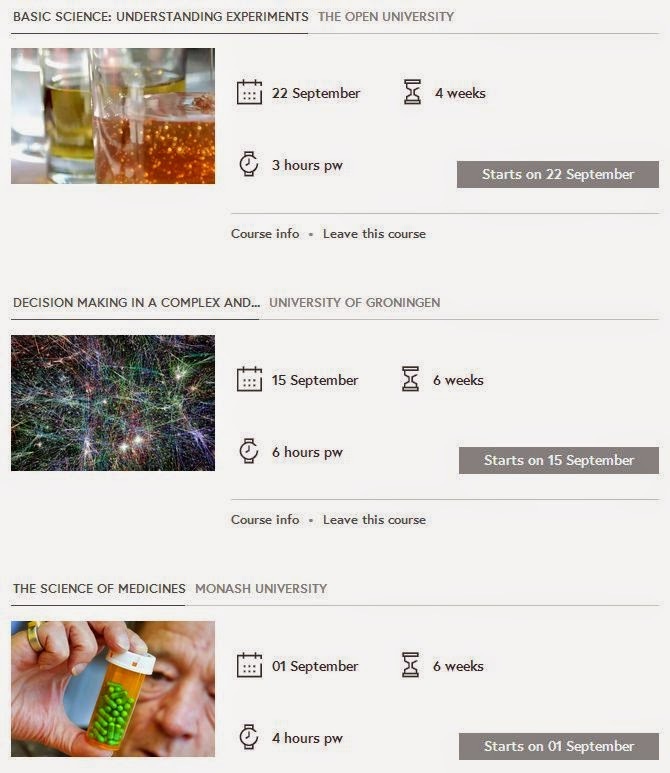 I choose this course as it was health related: building on past experiences I would think a lot of health professionals might be interested in this course as it might provide extra insight into medicines and pharmacy. The course also provides support for carers and people with diseases mentioned in the course. This is an additional bonus, as my pilot study showed that health issues can be a reason to follow a MOOC. And I am a diabetic type 1 (= insuline dependent, so interested in that health part as well). The course starts 1 September 2014, and lasts for 6 weeks, with a 4 hourse pw study time. Decision Making in a Complex and Uncertain World is my second MOOC of interest. This course will teach us the first principles of complexity, uncertainty and how to make decisions in a complex world. It is organized by the University of Groningen in the Netherlands and Lex Hoogduin is the course lead. The reason for choosing this MOOC to look for research volunteers was based on its content related to complexity. For MOOC learning, and especially experienced online learning has a lot to do with dealing with complexity. As such, I thought it would be interesting, and I hope to see some parallels coming out of the content, and the learning reflections. The course starts 15 September 2014, lasts for 6 weeks, and has quite a hefty 6 hours per week study workload (which is of interest as well, as high expectations sometimes provides high effort return). Basic science: understanding experiments is a hands-on course which introduces its participants to science-based skills through simple and exciting physics, chemistry and biology experiments. It is organized by The Open University, and lead by Hazel Rymer. This MOOC offers a different learning set-up: it is more practical, as course participants are asked to try out experiments in their own home (one of which is: getting DNA !). So this might ask different learning to occur. The course starts on 22 September 2014, lasts for 4 weeks, and has an estimated study workload of 3 hours per week. Excited by the prospect of getting people on board for this research... so will post as the next steps are ready. The past 50 minutes I have been blown out of my mind with this 74 pages slide deck "Personal learning in a Networked world" symbolizing the synopsis of a keynote Stephen Downes gave at the London School of Economics yesterday. In some cases Stephen rehashes slides from previous talks, but in this case all the slides seemed so new in their relating to one another, so connected in that they visualized an interdisciplinary, holistic picture of new learning opportunities, new data and computer ownership issues, looking at all people (not just students), and contemplating economic impact with autonomous ownership linked with cooperation. Really... from these slides I got so much information I am only capable of saying: read it! Great points such as: "New versions of old models don't produce new results" (cfr. text to mobile book, or boring class to instructivist MOOC), or the importance of personal (not personalized), networked learning and a lot of links to new tools (indietools) and yes philosophers. So for me, there was a lot of information, reshaped in such an inspiring set of thoughts. I am going to go through it again, reflecting upon it, hopefully building upon it... 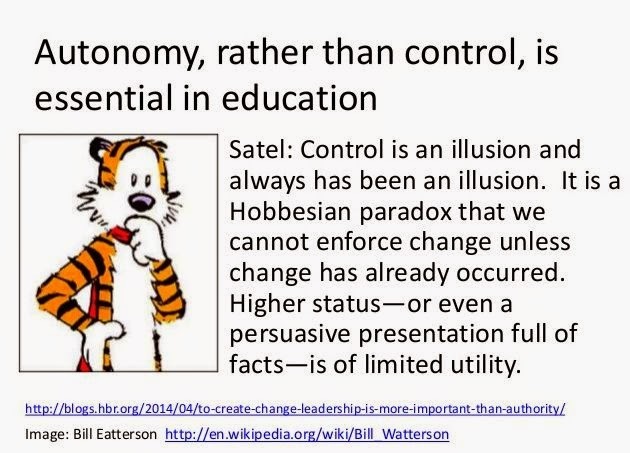 Admittedly I like what Stephen does, his professionalism linked to freedom of learning relates to my thinking, but the way he is able to connect fields to create the overall, bigger picture is at times so invigorating. I really envy that - in a good way, and as such it lifts me up. And there are similar minds that connect. One particular person Yishay Mor who immediately came to mind due to his work on Design Patterns and design Narratives which features a simple, yet often overlooked action: engender collaborative reflection among practitioners by a structure process of sharing stories and successful practice. This work and idea came up as an addition to Stephen's slide 52 on pattern recognition. Yishay organized a great workshop yesterday on MOOCs, more on that later. Okay, back to my writing work. USAid has just launched a contest for anyone willing and able to develop a software or tool that helps children in developing regions with learning how to read. Getting in the final will provide you with great feedback on your project, and how to improve it, with a bonus of 12.000$. The winner will get 100.000$ prize money, but ... this does mean extra creativity and understanding the challenges of native languages and mobile realities will be essential for this project. "All Children Reading: A Grand Challenge for Development (ACR GCD) is hosting Enabling Writers, a $100,000 prize competition to spur the development of software solutions that allow authors to easily create and export texts in mother tongue languages to help early grade students in developing countries learn to read. Three finalists will be awarded $12,000 each and offered feedback to improve their submissions for field testing. The technological solution that best enables local writers to quickly and easily create appropriate and interesting texts that follow tested reading instruction methodologies, and provide the optimum reading and learning experience for early primary school children, will win the $100,000 prize." The deadline for Enabling Writers is October 1, 2014. However applicants must register by July 18, 2014. 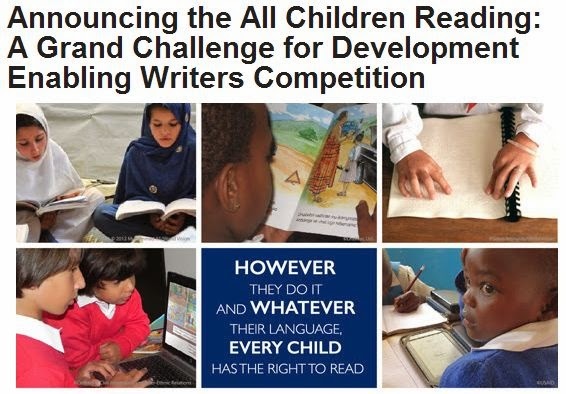 To learn more about the Challenge and to apply, go toAllChildrenReading.org or follow @ReadingGCD on twitter.